Compliant with Industry Accepted Standards. Available Sizes: 3" wide by 54 or 108 feet long. 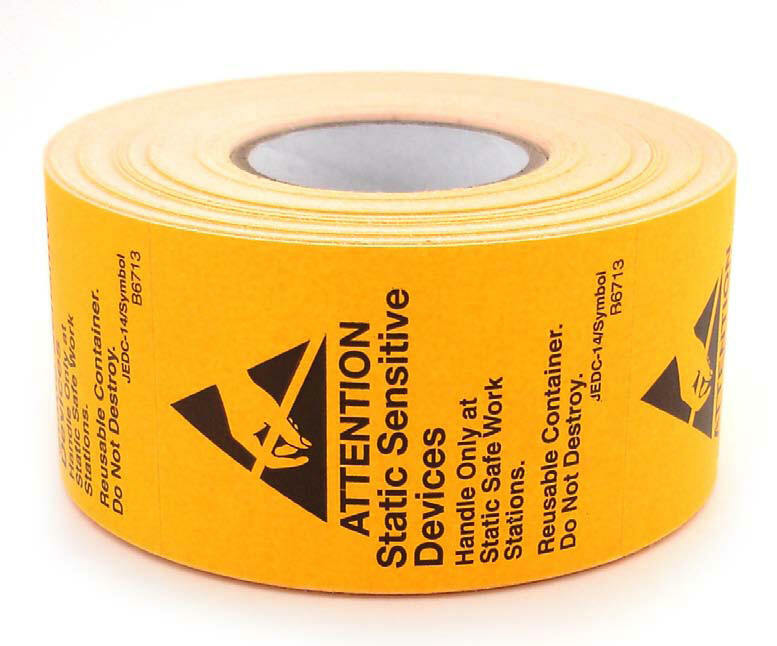 This high visibility esd aisle making tape is perfect for use on esd floors for marking the boundaries of a static safe work area. JEDC-14 style. Available Sizes: 5/8', 2" or 4" wide and 2" or 4" long. 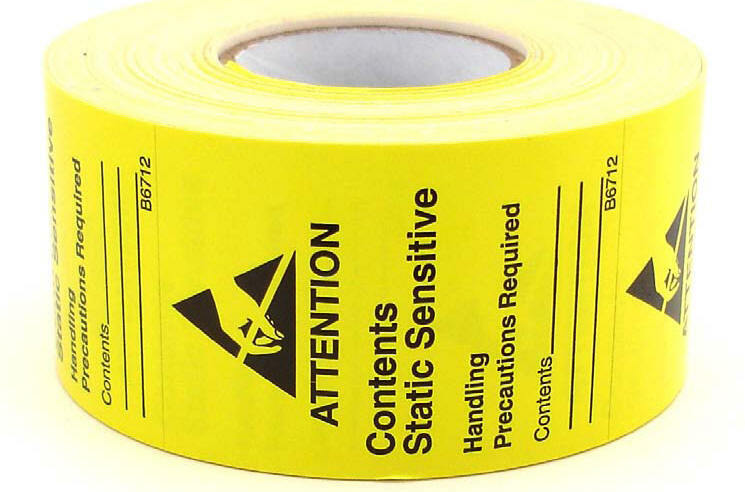 Bright yellow self adhesive labels with bold black print. 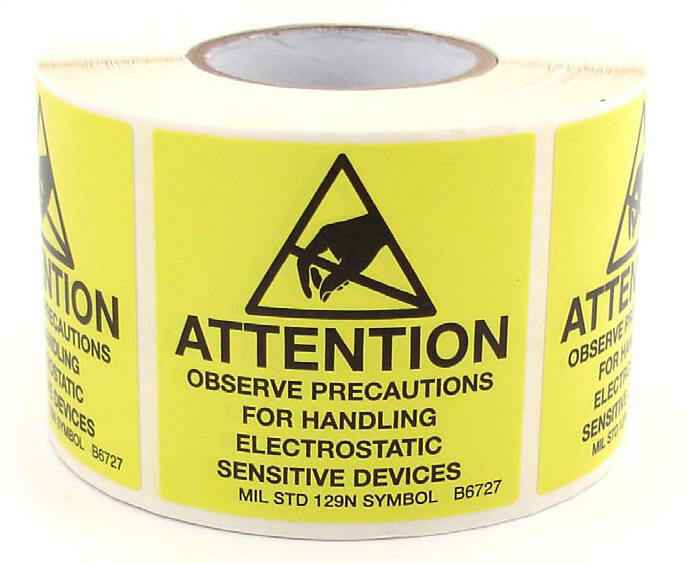 These pressure sensitive labels are designed to call immediate attention to items that are susceptible to damage from an electrostatic discharge. Available Sizes: 5/8', 2" or 4" widths and 2" or 4" lengths. 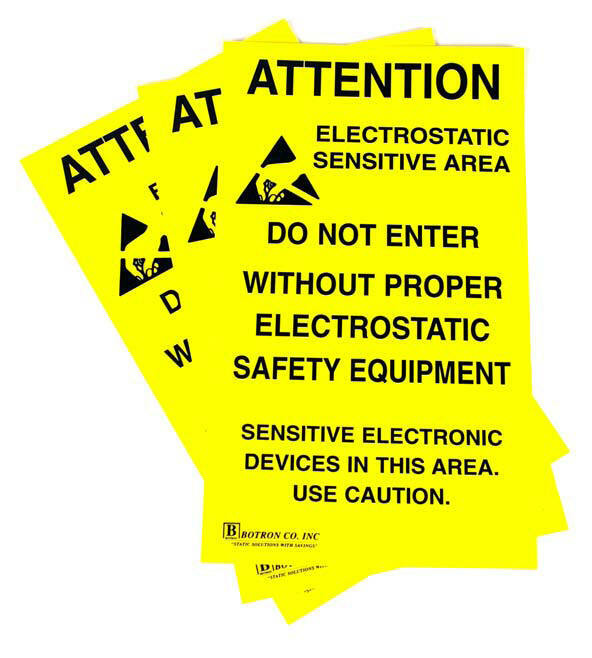 These bright yellow and black self adhesive esd awareness labels conform to MIL STD 129N and are designed to call immediate attention to items that are susceptible to damage from an electrostatic discharge (an esd event). 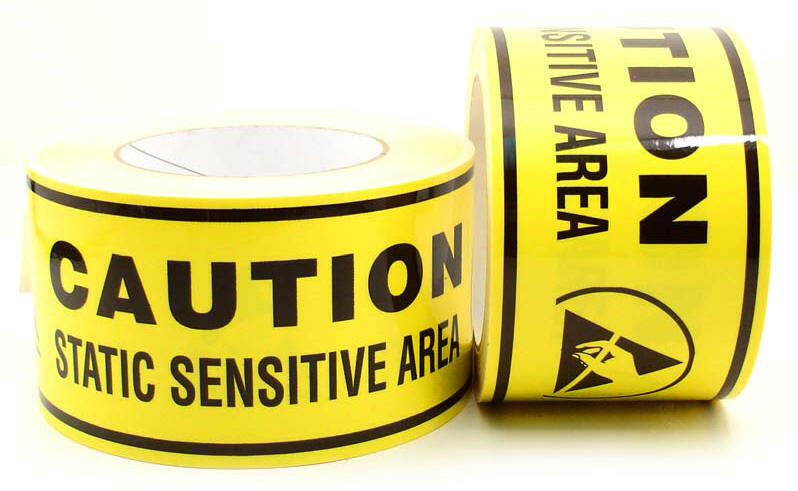 We provide these in 4 sizes with a permanent adhesive backing. The labels are coated for added durability and resistance to water, moisture and many common chemicals. Available Size: 1.75 wide x 2.5 length. Indestructible! 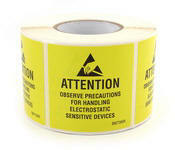 Bright yellow self adhesive labels with bold black print, JEDEC-14 style symbol and writable comment area. Reusable Container! 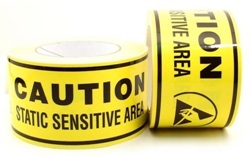 Attention Static Sensitive Devices! Available Size: 1.75 wide x 2.5 length. Orange with bold black print, JEDC-14 style symbol and marked with REUSABLE CONTAINER. DO NOT DESTROY. Available Size: 11 inch wide x 17 inch tall, sold in packages of 5 each. Yellow with bold black print, JEDC-14 (hand) symbol. Used for defining an esd safe area and warning visitors and employees that they must be in compliance prior to entering the area. 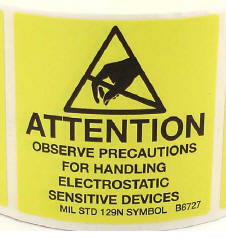 Attention Electrostatic Sensitive Area! ESD Awareness Poster. Size: 10 inch wide x 20 inches tall. Yellow with bold black print, JEDC-14 (hand) symbol. 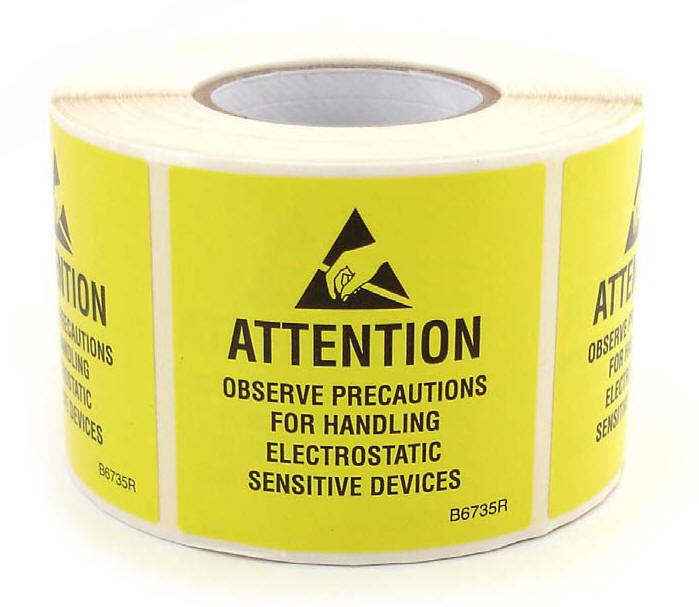 Used for defining an esd safe area and warning visitors and employees that they must be in compliance prior to entering the area. 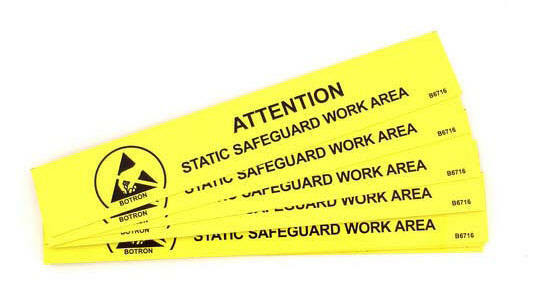 Attention STATIC SAFEGUARD WORK AREA! ESD Awareness Bench Signs. Available Size: 1" wide x 6" long. Yellow with bold black print, JEDC-14 (hand) symbol. 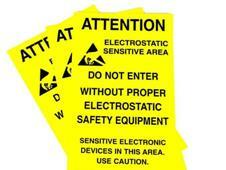 Attention OBSERVE PRECAUTIONS ELECTROSTATIC SENSITIVE DEVICES! ESD Awareness Area Signs. Available Sizes: 4" wide x 10" long. Yellow with bold black print, JEDC-14 (hand) symbol.